I don’t know about you, but for me, my favorite gifts at Christmas time are products that help me better care for either my children or my big dogs. I am not a diamonds or designer bags kind of lady, I’m a Twistep and Play Yard one. I tell my husband he hit the jackpot with me; I hate to shop and I’m easy to please. While my recommendation may not bring billions to these manufacturers or authors like Oprah’s does, my hope is that the following list gives you some ideas on what to get the big dog lover in your life this holiday season. A couple of caveats before I get started. First, this list is based entirely on products I use currently or, in one case, I plan to use in 2017. Many of these products I have been using for many years and absolutely swear by. Secondly, I am not being compensated by any of these companies for recommending their product and they have had nothing to do with my selection process for this list. And lastly, I am going to do a bit of a countdown to my number one most favorite product for 2017. You will have to stick with me to find out what that is. Unless you are someone that leaves nail cutting to your Veterinarian or groomer, chances are you are the one that gets the pleasure of cutting your big dog’s nails. In my opinion, there is no better invention for the cutting of dog nails on the planet than the Dremel. I used manual clippers like these for years, but got frustrated by how long the process took and how sore my hand would get cutting thick black nails. I switched to the Dremel a few years ago and I will never go back! It takes a little bit to get your dog desensitized to the sound and feel of the Dremel [READ:The Ultimate Tool Guide for Trimming Dog Nails and More! and The Ultimate Guide To Cutting Dog Nails And Having Them Love You For It], but once they are, it’s a beautiful thing! I cut Junior and Sulley’s nails once a week and they love it. I use the kit pictured here with the separate flexible shaft attachment. I had the great fortune of training our first mastiff, Maya, and our Labrador, Burton, in a facility founded by world renowned canine behaviorist and author, Patricia McConnell. Not only was Patricia McConnell’s influence and progressive training philosophy embedded in our early puppy and obedience classes, several of her books have had an enormous impact in my life and my relationship with my dogs. With an emphasis on understanding canine behavior first to both train and problem solve behavior issues, the following books are a few of my favorites. I consider these books MUST READs for all big dog owners. I actually have several copies of all of these on hand to loan out to friends…that’s how much I love them. Puppy Primer: A MUST READ for ALL new puppy parents. Period. The Other End of the Leash: Why We Do What We Do Around Dogs: For a foundational understanding of canine behavior and how our behavior impacts our relationship with them. Cautious Canine and Feisty Fido: MUST READ books for big dog owners with reactive dogs. As I was searching for answers for Linus [READ: Life With An Aggressive Dog: A Letter To My Sweet Baboo], I found a great deal of information and comfort in the book Cautious Canine and I can’t recommend it highly enough for owners with dogs who suffer from fear related reactivity. You Can Train Your Dog: Mastering the Art & Science of Modern Dog Training: Pamela Dennison is a Certified Dog Behavior Consultant and trainer with over 20 years of experience training and working with reactive and aggressive dogs. From raising a puppy, teaching loose leash walking and impulse control, to providing tangible step by step instructions for learning new skills and positively resolving behavior issues, this book really has it all. It is easy to read and follow and includes numerous illustrations, tips and alerts to reinforce the most important points. Like Patricia McConnell’s books, I consider this book a MUST READ for all big dog owners. When Sulley and Junior were eating a kibble diet, there were days I felt like I was raising horses not dogs with the amount of feces in our backyard. The daily task of picking it up required a serious, heavy duty scooper. Over the years, I tried many different kinds of pooper scoopers finding that most just weren’t cut out for the burden of big dog poop. I found the Nature's Miracle Jaw Scoop last year and have been very impressed with how it has held up and how easy it is to use. Now that the boys are raw fed [READ: Raw Food: A Decision Every Big Dog Owner Should Weigh], the volume of poop has declined dramatically, but I still love and use this scoop and wouldn’t recommend anything else. I just recently switched from a plain nylon leash to a leather one and I will never go back. I joked about Junior’s less than ideal leash manners in 5 Reasons Why Dog Handling Is Best Left To The Professionals. I was always frustrated by how the nylon leash would cut into my hand, but I was too cheap to invest in a durable leather one. I’m so happy I finally made the decision to make the switch. I love it! It is smooth in my hands, is incredibly strong, and I have been told by more than one person, it should last me forever. 6 FOOT LEATHER LEASH YOU CAN TRUST - Have you been looking for a durable leather dog leash? Then your search is OVER! Leatherberg leather leash is made of top quality 100% real leather with strong double stitching and a metal rivet on each end. Our Leatherberg dog training leash will hold up all dog breeds. PAIN - FREE WALKING AND TRAINING - Leatherberg leather leashes are made of 100% real Latigo leather. It's soft yet durable and absorbs some of the pull. We use the same leather material to make our leather dog leashes as other top brands in the U.S.
GET YOURS LEATHERBERG TODAY WHILE SUPPLIES LASTS - Check our special offers and product promotions below. Get 2 or more leather leashes and save money. TRUSTED - Why Do Amazon Customers Give Our 6ft Leather Dog Leash 5-Star Ratings? Our dog training leash is the #1 choice because of its professional grade quality. You'll be able easily control and train a dog with this amazing tool. 100% RISK FREE PURCHASE - "Does this dog leash leather come with a money back guarantee? YES! Your purchase comes with a full 1 year no-risk, no-nonsense 100% Money Back Guarantee. Either you're thrilled, or we don't want your money! See why Amazon customers rate our pet leash 5-Stars!" While this is not a product I have used, it is one that has come with such rave reviews from other big dog owners, that I felt it warranted a place on my top 10 favorite things for 2017. Just about every dog owner has to deal with dog hair, and big dog owners more so than the rest. I spoke candidly in How To Make A Great First Impression Big Dog Mom Style about my battle against dog hair and slobber with Mastiffs being both shedders and droolers. In my opinion, there’s not a better vacuum on the market for cleaning up dog hair. We bought our Dyson many years ago so the models have changed over the years. But even with extremely heavy use, our Dyson is still like new. When we are in the market for a new vacuum, we will be getting the Dyson Ball Animal model. It is certified by the Asthma and Allergy Foundation of America, is designed for homes with pets, and has the strongest suction of any vacuum cleaner I have ever used. 5 year . Free parts, labor and shipping. This one is not a necessity, but it has come in handy so many times for us that it makes the list as one of the best products for big dog owners in 2017. Whether it is cleaning up messes due to illness or upset bellies, or just the inevitable dirt tracked in from the outdoors by every member of the family, this steamer has been invaluable to us. We bought ours almost 10 years ago and have used it many times in the last decade; more than enough to justify the small investment. For carpet stains due to pet messes, you can definitely try solutions like Nature’s Miracle which I have on hand and love. But I have found some messes, like the ones left by Junior when he was transitioning to a raw diet recently, to be impossible to remove with anything less than the Rug Doctor. This is my absolute favorite dog bed for outdoors! We live in Arizona where in the summer temperatures can reach 115+ degrees. Despite the brutal weather, our Kuranda is 5 years old and looks like the day we bought it! It is durable, super easy to clean and made here in the USA. I just can’t recommend this bed highly enough, especially for big dog owners! Heavy Duty 40oz solid vinyl is our most durable fabric. Its ideal for determined diggers and larger,heavier dogs. Its smooth surface is easy to clean. And great for outdoor use. The Big Barker is a popular bed for big dog owners and we are no exception. Sulley and Junior have two Big Barkers, one in the living room and one in the bedroom, and they love them. With 400 lbs of dog laying on these beds every day, I am impressed with how they have held up. An added bonus is how easy they are to clean – just unzip the cover and throw it in the wash. And a huge bonus is that, like the Kuranda Dog Bed, Big Barkers are made here in the USA! If you have a puppy, I would also recommend adding the waterproof liner. I failed to get a liner while potty training Junior and I regretted it…several times. You can read more about that saga in Difficulty Potty Training Your New Puppy? 5 Tips For A Pee-Free Home. For use with the Extra Large Big Barker Pillow Top bed - Headrest Edition. Goes under the bed cover. If you have a big dog, you likely have a big vehicle. If not, I’m sorry. I have been there. But if you do transport your big dog in a van or SUV like we do, and you are concerned about their bones and joints as they have to leap in and out of it, you MUST check out this product! We had a ramp years ago with Maya and Burton. It was big and heavy and challenging to fit in the car when combined with luggage and people. My husband found this product and bought it for me for Christmas last year and I absolutely LOVE it! I put together this short video so you can see how easy it is to twist in and out from under our Navigator and how easy it is for Junior and Sulley to use. This truly should make the list of best inventions of the year in my opinion. I am also attaching the video from Heininger which goes into a little more detail about the advantages of the Heininger 3052 PortablePET Twistep Dog Hitch Step that I thought might be helpful as well. The Heininger 3052 PortablePET Twistep Dog Hitch Step tops my list for BEST product for big dog owners in 2017! Hands down! As of today, there are 54 days until Christmas. That is not much time and it will be here before we know it. Please take this list, use it while you shop for the big dog lover in your life, and share it with your friends using the share buttons below. Drop me a note in the comments below and let me know what you think of this list. What would you add that I omitted? Be sure to also check out Looking for Stocking Stuffers? 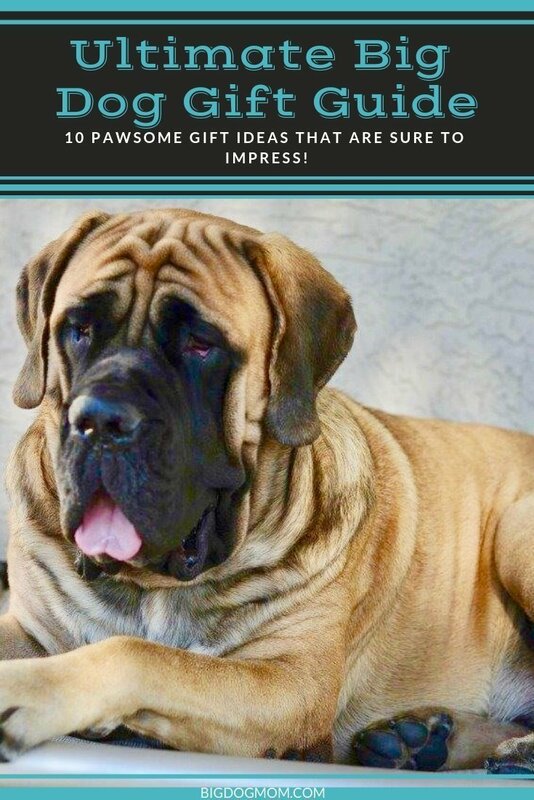 Top 10 Best Big Dog Gifts for some terrific gift ideas for you big dog! I will be putting together a gift guide each year around this time and will be looking for more great products that will serve large and giant breed dogs and the people who love them. Please connect with me on Facebook, Twitter, or Instagram, or send me an email at stephanie@bigdogmom.com with your feedback and suggestions. I’d add a Help’em Up Harness. They are amazing. Great suggestion, Erika! Thank you. I have heard of these, but never used one myself.